This was a Father's Day gift and dad loved it. I got this as a gift for a dear friend and he loves it! Give your golfing buddies a little style on the course. With personalized golf towels, they'll look like pros no matter what their handicap is. 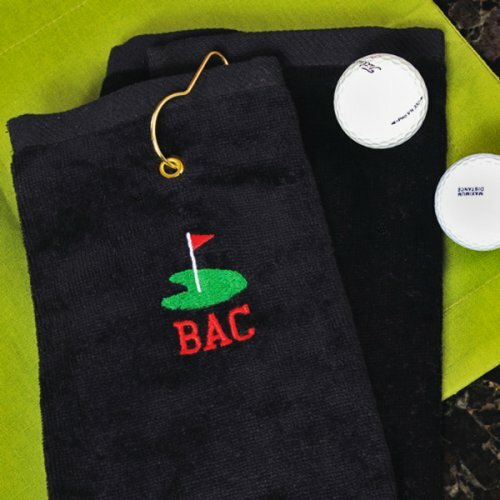 These cotton velour terry cloth golf towels are embroidered with a golf design as well as up to 3 block letter initials. Our golf towel is equipped with a closed hook for attaching to any golf bag. Perfect for groomsmen gifts or golf outing bachelor parties. Each towel measures 25"L x 15.5"W and is embellished with an embroidered golf design. Initials are embroidered in red thread. Pair with our golf tools key ring for a gift that's a hole in one! Check out other golf related favors and gifts.